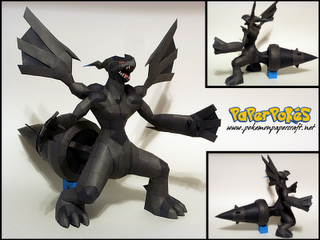 Zekrom is a dual-type dragon/electric legendary Pokémon that is not known to evolve into any other Pokémon. Zekrom is the version mascot of Pokémon White. Can't get enough of the Avengers? 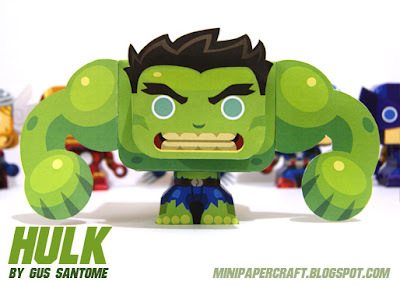 My Paper Heroes has started the Avengers paper toy series starting off with The Hulk. 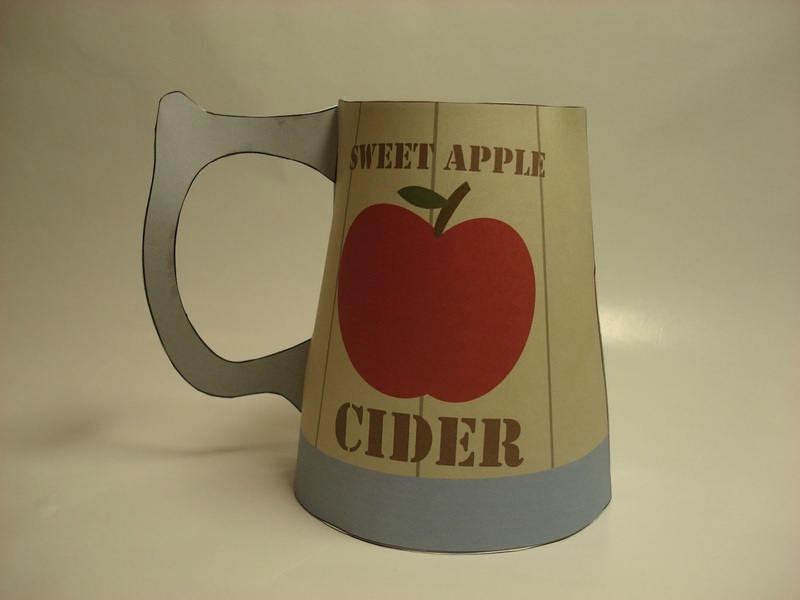 May is here and so is Didier's 3D calendar of the month. 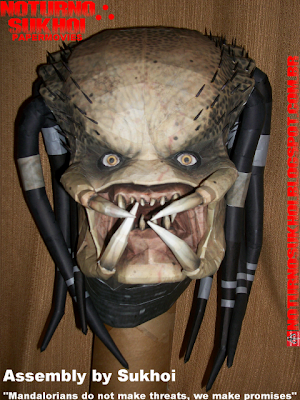 A beautifully-detailed Predator's head. Building it would take skills and a lot of hard work as this model has 59 pages of parts. Yoshi becomes a Blimp Yoshi after obtaining the Blimp Fruit which gives him the ability to propel himself and Mario in to the air for a limited amount of time. 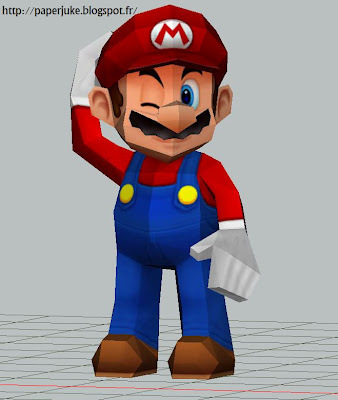 This power up was first introduced in Super Mario Galaxy 2. This is the most detailed light saber model we've seen to date. 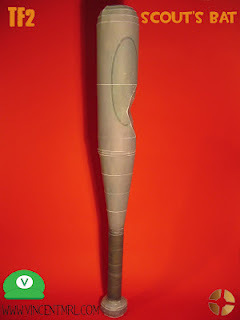 It is based on Luke Skywalker's as it appeared on Star Wars episode VI : Return of the Jedi (ROTJ). 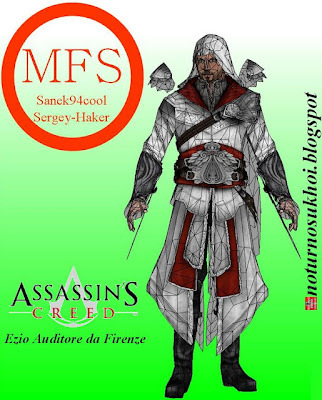 It was designed by Yudhie Hatmadji aka Saplatheamazing. Toysrevil is giving away a signed copy a papertoy designed by Zakane. Check out this post for more info. 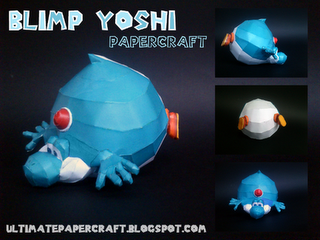 A Super Mario papercraft with low polygon. Just 5 pages of colored parts for this 19 cm tall model. 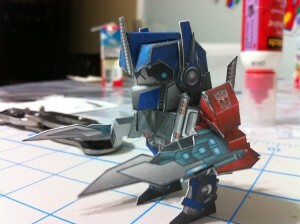 We've seen many different versions of Optimus Prime papercraft. 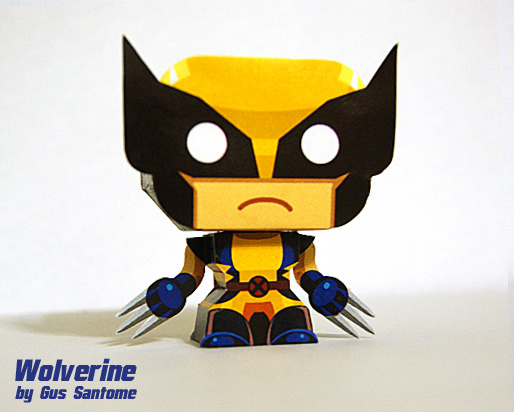 If you're a fan, here's a chibi version by WuLongTi to add to your collection. 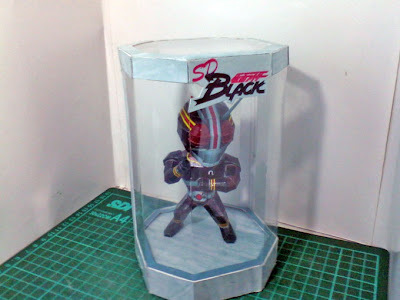 It is based on Optimus Prime as he appears in the animated series Transformers: Prime. 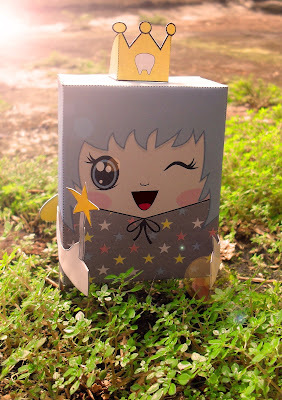 An official paper toy created by Desktop Gremlins for Google and YouTube Space Lab. YouTube Space Lab is about space. 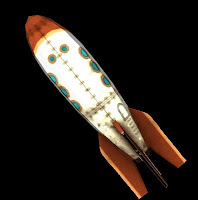 They believe that space is more exciting and accessible than ever so they asked you to come up with a science experiment for space and upload a video explaining it to YouTube. The winners, selected by yourselves and an expert panel of judges, will have their experiments performed on the International Space Station and live-streamed on YouTube to the world. 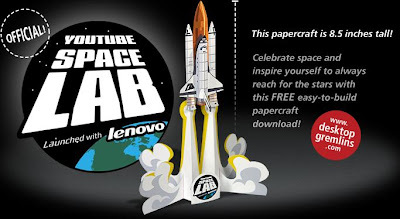 Visit youtube.com/spacelab for the announcement of the winners and discover space by watching the amazing videos they find from across YouTube. 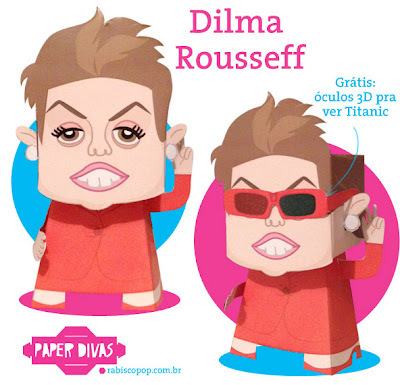 Dilma Rousseff is Brazil's current and first woman president. The paper toy even comes with her own 3D glasses. Large Skull Head monsters from the indie game, Super Crate Box by Vlambeer. 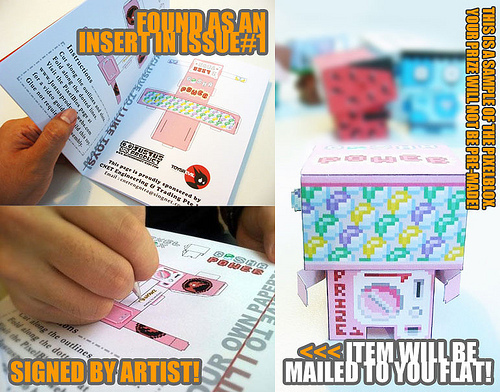 Only one page of parts per toy and use elegantly simple rotational pivot tech designed by Alexander Gwynne. A mini Hulk flexing its big muscles. When we were kids, we hear from the adults about the tooth fairy that comes to get our baby tooth placed under the pillow to replace it with gold. 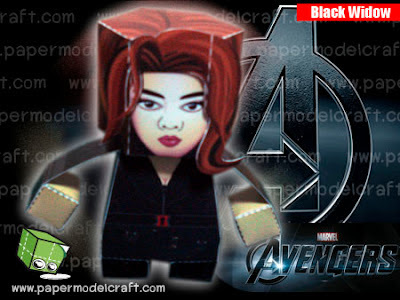 More from the Avengers - this time it's Black Widow. She's played by the beautiful Scarlett Johansson in the movie. 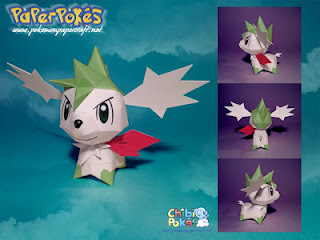 Shaymin is a grass-type legendary Pokémon. 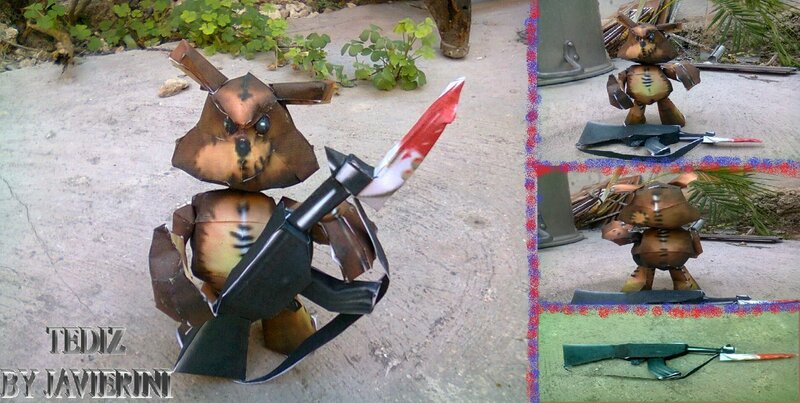 It is not known to evolve into or from another Pokémon but has a second Forme. 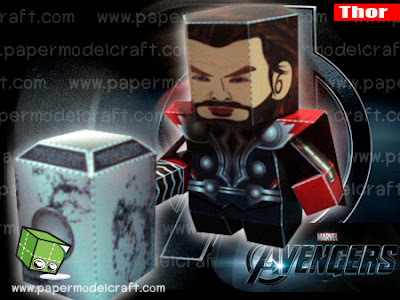 It is Thor with his over-sized hammer Mjolnir. 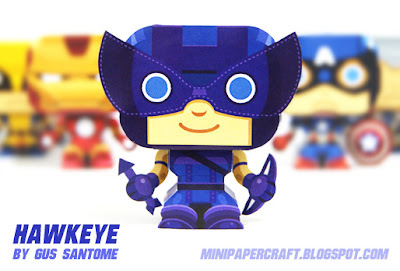 This paper toy from Gus is based on the comics costume of Hawkeye. 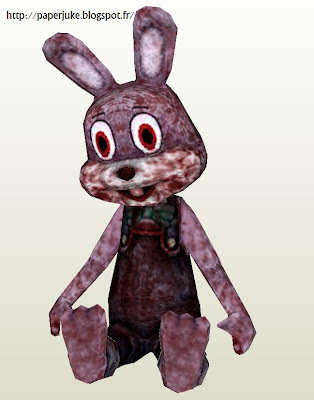 Robbie the Rabbit is an anthropomorphic rabbit doll that has made appearances in many of the Silent Hill games. 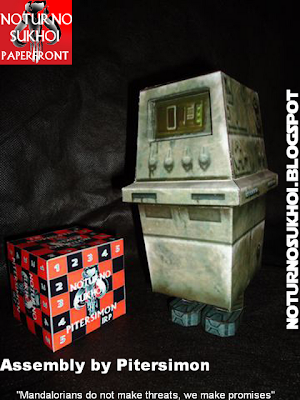 The GNK power droids aka Gonks are walking power generators in the world of Star Wars. 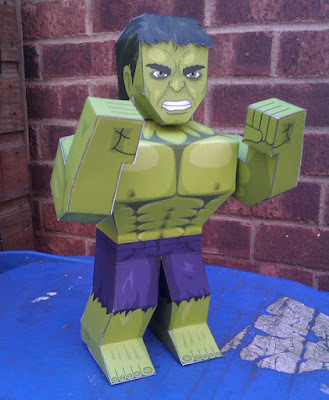 It's Bruce Banner aka The Hulk from the Avengers. He's played by Mark Ruffalo in the movie. 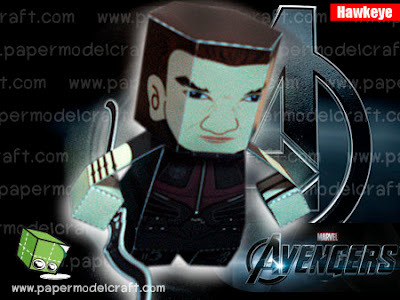 A paper toy based on the Avengers' member Hawkeye as played by Jeremy Renner in Marvel's latest movie. Go Scout Creative's calendar for the month of May feature a coffee with an appetizing donut. 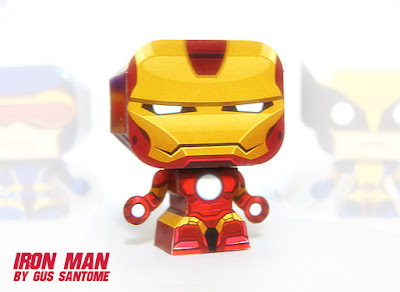 Can't get enough of The avengers? 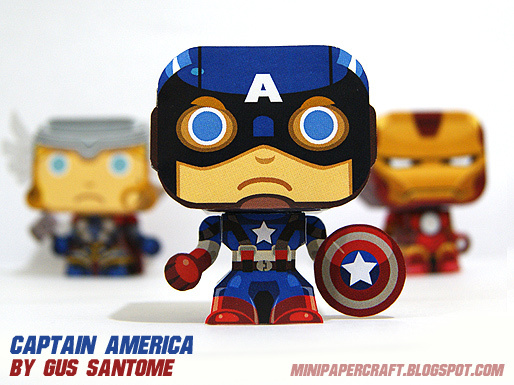 Here's a second version Captain of America for today. Really cute! 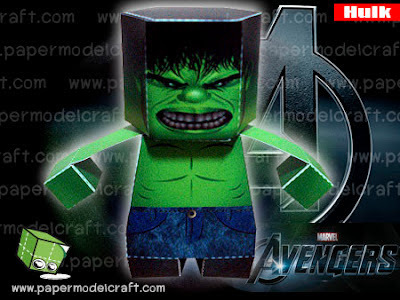 Still haven't seen The avengers yet but I hope to see it soon. 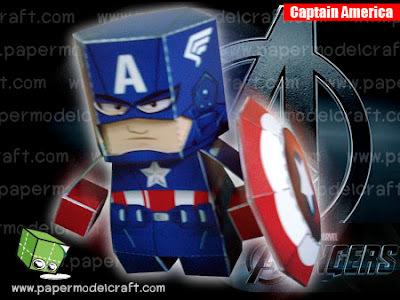 Anyways, here's a paper toy version of the super soldier Captain America based on the latest Marvel movie. 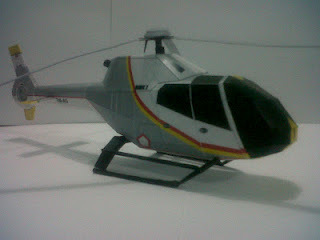 A 1:30 scaled model of the Eurocopter EC120 Colibri, a 5-seater, single-engine, single main rotor, light helicopter jointly designed and developed by different manufacturers. 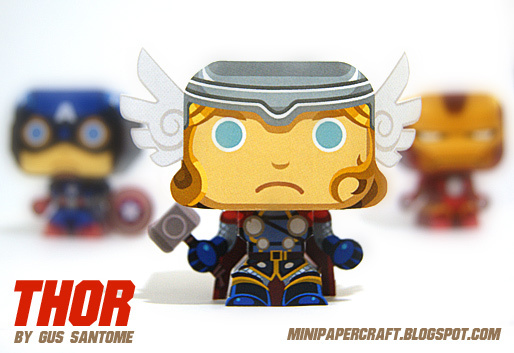 A cute paper toy version of the God of Thunder Thor. Just in time for the Avengers movie. It's the life-sized bat wielded by the scout from the Team Fortress video game. 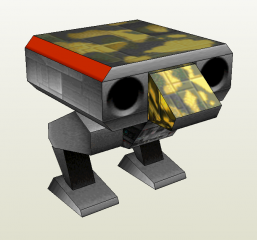 A robot from the Playstation 3D anime-style action-adventure and platform game Tail Concerto. Ongo Arts is back with an octagon container to put the SD Kamen Rider papercraft he released last month. Dissidia is one of the playable characters in the PSP fighting game Dissidia. Firion is originally the main protagonist of the RPG Final Fantasy II. billybob884 has released a total of 13 power-ups from the old-school Sega Genesis video game Sonic 2. 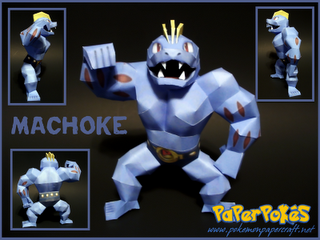 Machoke is a fighting-type Pokémon that evolves from Machop and into its final form Machamp. It looks like a huge reptilian wrestler. 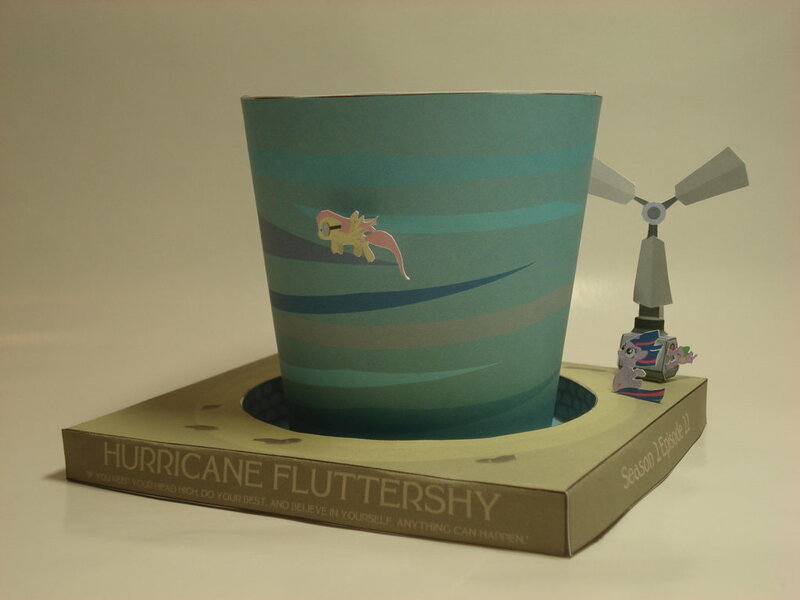 This papercraft from RockertmanTan is based on Hurricane Fluttershy, the twenty-second episode of the second season of My Little Pony: Friendship is Magic. Wolverine is one of the members of X-Men and later on, the Avengers. 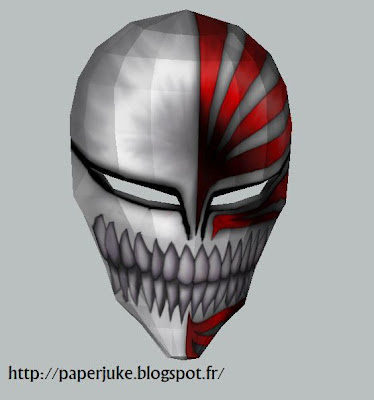 Ichigo's hollow mask as it appeared on the anime Bleach. Princess Leia Organa of Alderaan is a character in the Star Wars universe. 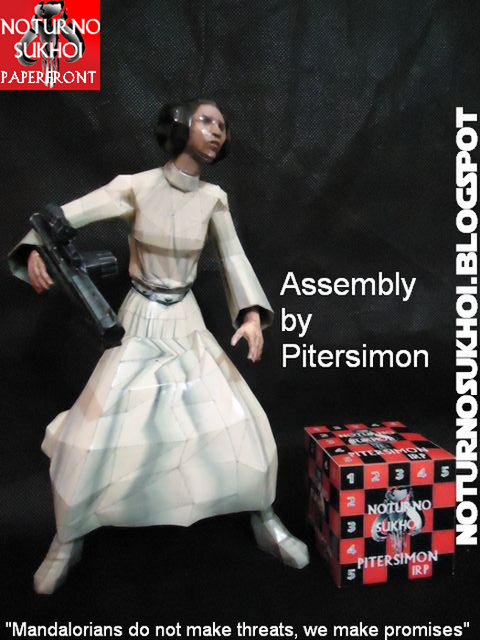 She is the win sister of Luke Skywalker. A super deformed version of Iron Man. 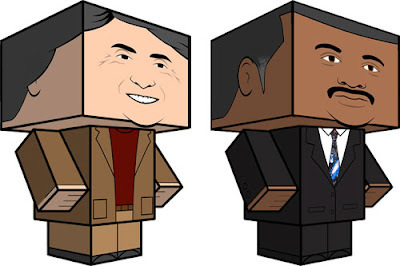 In anticipation of the upcoming Marvel movie The Avengers, more characters will follow. Watch out for that. 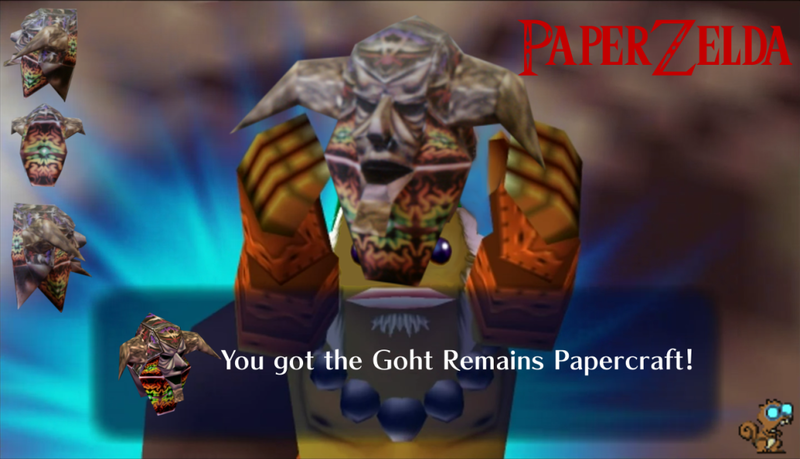 This mask is obtained by Link after defeating the Masked Mechanical Monster, Goht in Snowhead Temple. 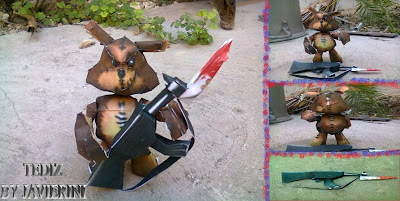 The Tediz are a race of robotic teddy bear-like creatures who first appeared in Nintendo 64's action adventure game Conker's Bad Fur Day. 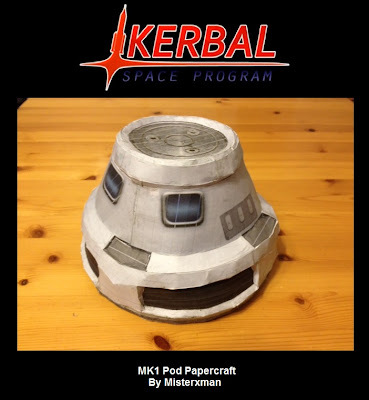 The Command Pod Mk1 houses the Kerbal crew during their mission in Kerbal Space Program, a currently in-development space flight simulator game that allows players to build a rocket and launch it into space. 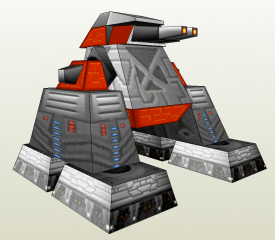 The Dominator is a level 2 kBot that fires heavy rockets and can travel over almost any terrain, like the Thud while the Sumo is a very heavy and slow kBot sporting serious fire power.